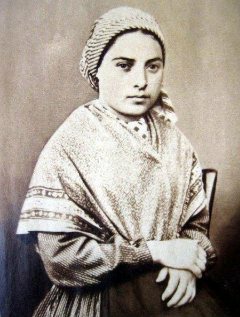 On January the 7th 1844 our Glorious Bernadette Soubirous was born, her mother named Louise Casterot and father Francois Soubirous. On the 9th of January Bernadette gets Baptized Marie Bernarde. Bernadette was sent away to be fostered because Bernadette's mother could no longer produce milk. Bernadette was fostered by Maria Lagues, who was able to breast feed her. Bernadette returns to Lourdes (Boly Mill) ready to be weaned. Bernadette had a very loving family and enjoyed playing with her sister Toinette. She remains in the Boly Mill until June 1854 when they moved to Laborde house due to financial hardship. Cholera breaks out in Lourdes, Bernadette is 11 years old and unfortunately became ill with Cholera, she survives but develops Asthma and tuberculosis of the bone, affecting her legs which lead to her death at just 35. Louise, her mother dies of Cholera and she inherits 900 francs, a good amount in those days. Francois invests everything in Sarrabeyr House Mill hoping to improve his families life. Unfortunately their misfortune never ceases and it turns in to a failure. Francois loses everything and they return back to Lourdes. Their family destitute they find shelter at the Cachot, a disused dungeon room which his cousin let them use. Bernadette's family hits rock bottom. Marie Lagues of Batres, hires Bernadette as a shepherdess, a domestic worker and to look after 2 year old Jean, she moves to Bartres and finds life is hard. It was a period of very hard work and solitude, humiliation and tears. Bernadette sends a pleading message to her parents "beg them to fetch me as soon as possible" she returns home on January 21 to poverty and a dungeon like Cachot. But is happy to be back in family life. This is the date of the first apparition, while collecting firewood with her sister, (for more information on the apparition, please look a the apparitions information page). Is the feast day of Courpus Christie and Bernadette receives her first Holy Communion in the chapel of Lourdes Hospice where she is being treated for asthma and tuberculosis at 14 years of age. Bernadette is back in the hospice of Lourdes due to another asthma attack. Bernadette remains in the hospice for 6 years until she departs for the convent in Nevers. The construction of the Chapel requested by Our Lady to Bernadette begins which postpones Bernadette's departure to Nevers. Glorious Bernadette becomes a nun and joins the Sisters of Charity in Nevers. Before leaving dressed as a nun she secretly visits the grotto for the very last time. Bernadette enters the convent of Saint Gildard, but finds it difficult to settle in. She meets with resistance and humiliation both on the part of the nuns and the Mother Mistress, Sister M.Therese Vauzou. Bernadette is ill and suffering once again while she lies on her sick bed struggling to breath and to comprehend why she has to suffer so much. Bernadette tells sister Lentine " I am ground like a grain of wheat". Stretched out in an armchair to aid breathing, she slips away at 3pm. Asthma and tuberculosis of the bones of her legs have wasted her away at 35. In one day she summarizes her whole life and mission on a piece of paper. "To obey is to love! To suffer in silence for Christ is joy! To love sincerely is to give everything, even grief". Pope Pius proclaims Glorious Bernadette a Saint. 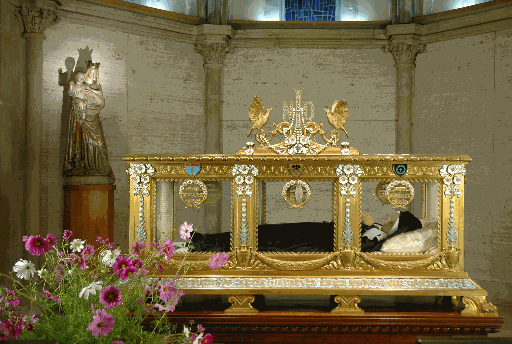 Saint Bernadette's body today remains in a perfect state intact and covered by a thin layer of wax for preservation. Her body rests inside a bronze and crystal casket.